Member of Production Engineering's Traffic team developing reliable and scalable networking infrastructure to serve high-volume flash sales. Pioneered tooling framework to automate server tasks and interfaced with ChatOps bot. Presented tools to production engineering Shopifolk, now used on a daily basis. Co-authored Chef configuration to move non-core services to new load balancers. Presenting the tooling framework I worked on to Production Engineering Shopifolk. Within Shopify I worked with the Traffic Team in the Production Engineering Department. Production Engineers' work is often described by the metaphor “building a plane as it flies”. In other words, we maintain, adapt, and scale our web infrastructure while keeping Shopify's service online. The Traffic team is responsible for the networking layer of Shopify’s infrastructure and the success of the team comes from our Trafficability. Specifically, we focus on reliability, (in)visibility, and scalability. Reliability comes from having a high uptime (we aim for 100%), mitigating the effects of Internet problems and distributed denial of service (DDoS) attacks. Traffic strives to be invisible to our merchants by making continuous behind-the-scenes improvements and ensuring that packets get to their destinations on the Internet and within our data centres. Finally, the team focuses on being highly visible within Shopify by sharing the work and methods we use to educate and give greater context to other Shopifolk. Production Engineering Summit brings together Shopifolk for two days of department updates, goal-setting, and team building. 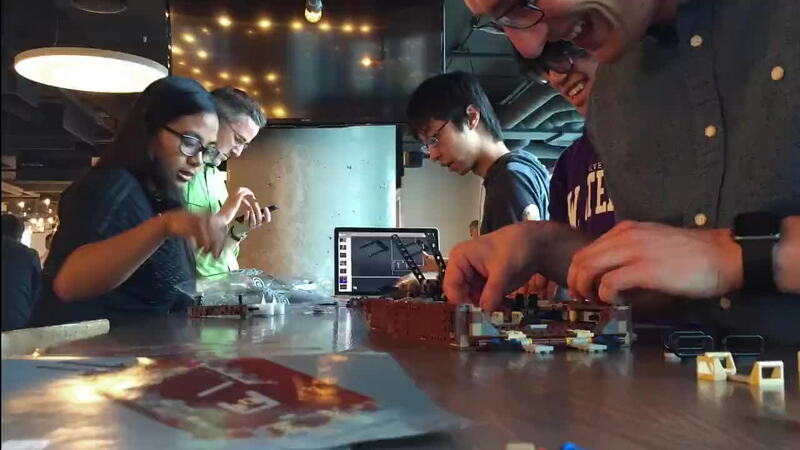 This year's activity tasked groups with building giant 3,300-piece Lego models (ours was the Star Wars Sandcrawler). The underlying theme was "building a sequential product in parallel". Shopify treated interns to a weekend retreat in Mont-Tremblanbec, Québec. It was a great opportunity to go for a hike, kick back, play games, and get to know my fellow interns! Shopify values people who can draw the owl.